The American Bald Eagle is a majestic and beautiful creature, it soars with confidence as it hunts. 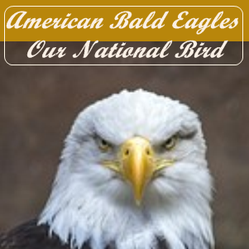 American Bald Eagles are on the endangered list. They were once in bad shape, luckily their numbers are rising again. They are the United States national bird and their images are on many government seals. My love for the american bald eagle goes beyond the average appreciation of them, I have them everywhere and even have a chest tattoo of one. I feel they are proud and majestic as they soar so high while looking for food. A few miles away there is a breeding pair going on their third year together, they live off the side of a lake. Last year they had two young babies that were about to fly when I was there. Our fore fathers that created the Unites States must have loved the eagle also, making it the national bird and even going farther to put the bald eagle symbol on our national seal. It was a symbol of pride and strength with them, the eagle will persevere and so will we. This Beautiful and large bird of prey ended up on the endangered list from high power lines and foolish people shooting at them for no reason other then to kill something. Even farmers saw them as a risk to their livestock and shot them. It would have been a real shame to let this bird disappear forever, so we started to protect it and we helped with breeding to bring the numbers back up to acceptable levels. While it is still on the protected list, it's numbers in the wild are increasing. The average life span of an american Bald Eagle is 15 to 25 years and it is common for some to live into their 30's depending on the conditions where the live. The female is slightly larger then the male with an average body length of 36 inches, the wingspan of a Bald Eagle is 70 to 90 inches. With a body weight of around 10 to 14 pounds they can easily lift 4 pounds of food. The American Bald Eagle has a hook shaped beak designed for tearing at it's food, it has long and powerful claws that are like daggers that go into prey animals with razor sharp precision. The bald Eagles food consists of fish and small animals, it will not pass up a freshly killed one either. Eagles will mate for life and use the same nest for many years, the nest can become very large weighing up to 2 tons and 9 feet across. The American Bald Eagle does not have vocal cords but it emits a loud shrill through a bone in the head, if you was to hear it you would never forget it. This noise is to ward off other eagles that this is his area and it will be protected, it is also used to strengthen relationships with it's mate. It usually lives off a body of water, the Bald Eagle food consists mostly of fish. It has eyeballs close to the size of humans and can see four times clearer with perfect vision. Seeing an eagle hunt is a sight you would never forget, they hunt from way up high so the fish does not see the eagle. When an eagle picks out a fish it goes into a dive that reaches speeds of 100 miles per hour or faster to get to the fish and surprise it. The eagle swoops into a parallel glide just above the water and snatches the fish out of the water with razor sharp talons, the fish never knew what hit him. The bald eagle is not bald at all, it has a gorgeous head of white feathers with a black feathered body. The chick is born with white fur down and then grows brownish feathers, the head does not turn white until the bird matures. The bald eagle has a closely related golden eagle in the family, this bird has a golden brown head and is similar to the bald eagle.This golden eagle is even harder to find then the bald version. My love and adoration for these birds is well deserved, they are beautiful creatures. When taking Bald eagle photos you need a good telephoto lens and fast camera, it is best if you can locate a bald eagles food source. They will be close to this area and you may be lucky enough to catch them hunting. The wingspan of a bald eagle would make a good photo. iggy, Thank you for the nice introduction to and review of our national bird. You have a nice choice of books that should be fun to have since I enjoy hearing and seeing the bald eagles almost in my backyard. yes, enough to get a tattoo of one. Don't you just love these birds! We have a oair of eagles that built a nest, and for several years now have had 2 or 3 young. And, another nest appeared this year not far away.